Aurah Landau | ADOT&PF Nov 21, 2017. (JUNEAU, Alaska) – The Alaska Marine Highway System (AMHS) announced today that extended repairs needed on the MV Malaspina will change winter ferry service for Southeast Alaska and Prince Rupert. The Malaspina went in for its annual overhaul and certification on October 1, 2017 and was scheduled to return to service on December 22, 2017. During the overhaul, engineers determined that extensive steel replacement was needed and that both propeller hubs must be repaired. Because shipyard space is limited and propeller hubs will take several months to complete, the vessel is now scheduled to return to service in late spring. From December 22, 2017 to February 23, 2018, the Columbia and LeConte will cover for the Malaspina. Most Southeast Alaska communities will receive winter ferry service once a week and service to Prince Rupert is canceled. At the end of February 2018, the Kennicott will return to service to cover for the Malaspina and full ferry service to Southeast Alaska and Prince Rupert will resume. Affected passengers are already being notified by AMHS staff. For passenger information, please call a local terminal or the AMHS central reservations office at 1-907-465-3941 or toll free at 1-800-642-0066. 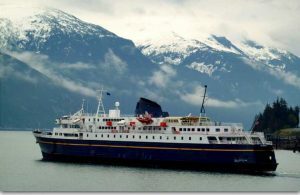 An updated schedule will be made available online at FerryAlaska.com. Service notices may be found at dot.alaska.gov/amhs/service_notices.shtml or by contacting a local terminal at 1-907-465-3941 or toll-free at 1-800-642-0066.